When you’re injured as a pedestrian or as a bicyclist, you have the same rights as someone who is insured in another motor vehicle. We can bring a case on your behalf for your injuries, your damages, your pain and suffering, your medical bills. I will help you every step of the way in order to make sure that your claim is handled properly and that we maximize the results for you. 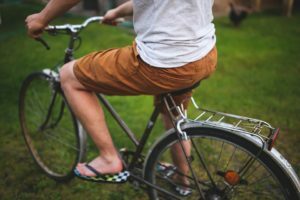 It is important that you know the laws that you are required to abide by as a bicyclist in New Jersey to make sure you weren’t breaking them during your accident because this could have an impact on your case. Bicycles that are ridden at night must be equipped with a head lamp that emits a white light that can be visible 500 feet away, a rear lamp that emits a red light that is visible from 500 feet away as well as a red reflector on the rear of the bicycle. All bicycles must be equipped with an audible signal such as a bell that can be heard at least 100 feet away. Sirens and whistles do not count as audible signals. New Jersey law states that any person under the age of 17 years old must wear a safety helmet. The law also states that bicyclists must ride as far right on the road as they can. Bicyclists have all of the same rights as a person driving a motor vehicle and must ride in the same direction as cars on the roadway. Like the laws of motorists, bicyclists must always yield to pedestrians.